LONDON, England (CNN) -- He's a helicopter test pilot who spent 18 years in the British Army. He just beat more than 8,400 others to become one of Europe's newest astronauts, destined for the International Space Station. Helicopter test pilot Tim Peake is about to venture a lot further as one of six new astronauts at the European Space Agency. So what is Tim Peake most nervous about? "That's an area that I think will probably be quite difficult for me," said Peake, 37, in an interview Friday with CNN. It certainly speaks volumes about Peake's experience that he considers learning a language the hardest part of his new job. His career in the British Army's Army Air Corps involved flying and teaching on helicopters in Germany, the United States, and Britain before becoming an experimental test pilot. He left the service this year having achieved the rank of major, though he is still a reservist. 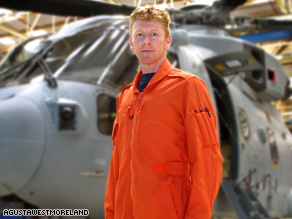 Peake now works as a test pilot for helicopter designer and manufacturer AgustaWestmoreland, primarily doing flight testing on Apache and Lynx helicopters. "We really get involved in an aircraft program from the drawing board right through to the first flight," Peake said. "You hope everything will go right, everything's been designed right ... but until you lift the aircraft off the ground, you're never quite sure what's going to happen." This month, the European Space Agency chose Peake and five other Europeans to be its newest generation of space explorers. They will begin training later this year with the goal of completing future missions to the International Space Station (ISS). The six were chosen from among 8,413 applicants and include another test pilot, one fighter pilot, a commercial pilot, and an engineer and a physicist. They come from Italy, Germany, Denmark, and France. The selection process took a year and involved medical, psychological, and professional screening. Peake said there were tests on memory retention, math and engineering, coordination, and spacial awareness. "They were the kind of tests where in some circumstances, if you were a perfectionist, you would have found it very frustrating because with a lot of them you couldn't complete them 100 percent," he said. The applicants were tested on problem-solving and team-building before having an hour-long interview in front of a five-member panel. After that came a week-long intensive medical exam that covered everything from ear, nose, throat and eyes to bone density. "It was a very good mid-life review," Peake joked. And while he wasn't told the results of his medical test, "they did tell us that everything was fine." Peake said he didn't think he'd gotten the job. The ESA was due to announce the winning applicants on May 20, but as the day approached, Peake said his phone went quiet. "I hadn't heard anything for nearly four weeks, since my final interview, so as the time got closer to the final press conference ... I naturally assumed, well, it's not me," he said. Then his phone rang. He saw the Paris number and figured it was a rejection. In fact, it was the ESA calling to tell him he'd been selected in what Peake says was "the biggest life-changing telephone call I've ever had in my life." "It was just the most amazing feeling in the world," he said. "I was absolutely delighted. It's an incredibly privileged position to have." Now that the media frenzy has subsided, Peake said, it's back to work. He still has his job at AgustaWestmoreland and must also find a place for his family to live in Cologne, Germany, for when training begins there in September. Peake is married to Rebecca and they have a four-and-a-half-month-old son, Thomas. The 18-month training is mostly technical but also involves Russian language courses so the astronauts can become fluent. Russian and English are the two official languages on the ISS. At the end of the training, the six will be qualified astronauts, eligible for mission assignment. And once assigned to a mission, they will undergo two to three years of mission-specific training as a crew. Peake said he's hoping to go on multiple missions to the ISS. Some may be the standard six-month missions while others may be shorter resupply stints, he said. He's never been in space before and says he doesn't really know what to expect. "I would imagine if it's anything like previous test flying I've done, when you get so embroiled into the training for a mission, it's almost as if you just let the training take over," he said. "However, I'm sure there will be a few moments when you might be able to take pause." A veteran astronaut advised Peake not to forget to "look down and enjoy the view," he said. "I think it will be one of the most beautiful sights that you could imagine," he said.